Renting a car online when traveling to Mexico can be pretty tricky. You might think you got a real “too good to be true” deal, and book for a car online for $20/day, but when you arrive at the airport and claim your car you will find some other charges attached to the agreement – insurance, taxes and hidden fees – and soon a nice $20 deal turns into a $65 monster! Too many rental companies are deceptive like this, even if they are a trusted company back at home. This means that customers have to be extremely careful and examine the rental agreement’s fine print to find where the trap is hidden. Now, that doesn’t sound like how anyone should have to start their vacation. So, finding a trustworthy company is essential for having a really great vacation in Mexico without the stress and hassles of fine print. Why book with Getaway Car Rental? 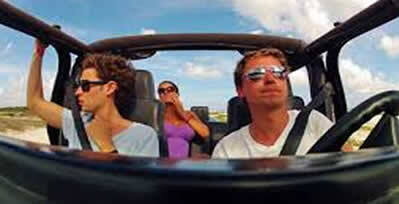 If the Cancun area is your destination, Getaway Car rental is the best place to go. You can be relaxed and sure that you are getting a really great deal. Their rental rates include the mandatory Mexican liability insurance, medical expenses insurance, and the option to purchase Collision Damage Waiver coverage. Getaway Car Rental truly recognizes the stress you may feel when you plan a trip to another country. Therefore, they work hard to stay available 24/7 to serve travelers and take care of their car rental needs. Their website, getaway.mx, provides helpful information, toll free numbers to call from anywhere in Mexico, the US and Canada, and an email service that answers any questions any customer may have. If you are planning to go to Mexico, and want to have a really relaxing vacation, you should give Getaway a try. They have earned their reputation for the best rates, transparency and honesty, and customer service excellence to boot.